The structure of this book is unlike other instructional artbooks that I've seen. 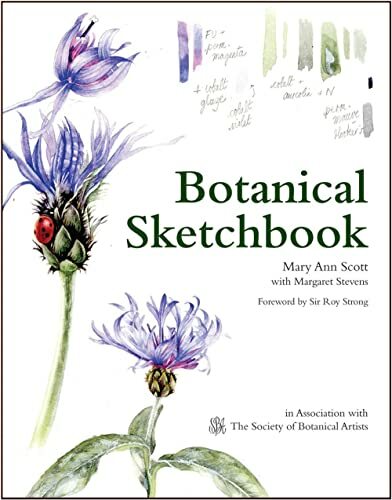 This book is essentially a record of Mary Ann Scott's process and experience as a student in the Distance Learning Diploma Course that's run by Society of Botanical Artists. If you're wondering if it might be better to learn from an instructor rather than a student and you are right to think that way. But there's a lot to learn from mistakes and the learning process itself. The insight comes from what Mary Ann Scott has learned in the course. It's best if you have some basic knowledge to drawing and watercolour because the book dives right into the assignments. This book is based on that diploma course and there are 11 assignments and each tackles a different subject, technique or concept. There are no step-by-step instructions in this book. There are only notes from what she has learned, and also additional notes from her tutors and the Margeret Stevens, the president of the Society of Botanical Artists. There are many beautiful artworks included, and most are captioned with the colours used for mixing. And you can see the progress in the quality as well, from the first to last assignment. There's one assignment on drawing out in the field, and one drawing from photographs. Overall, I think it's quite an insightful book for those interested in botanical art.